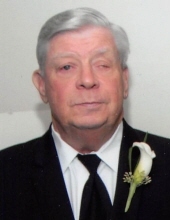 Franklin Whittington, Jr., 74, of Fayetteville passed away on Saturday, March 23, 2019. Frank was born at Fort McPherson in East Point, GA on October 16, 1944 to Franklin and Dorothy Whittington, Sr.
Before moving to Fayetteville and FFUMC in the early 70's, Frank was a member of Red Oak UMC. He graduated from Lakeshore High School. He worked at Ford Motor Company before being drafted into the United States Army. After being discharged, Frank started a career in roofing. He worked for Rex and Jerome Pierce of RC Pierce Roofing, Lance Roofing, Kelco Roofing, and Heely-Brown Roofing Co. Frank ended his notable career with Larry Burns of CRS, Inc. in Doraville, GA.
Over the years Frank enjoyed a variety of activities with family and friends: golfing, fishing, hunting, sporting clays, industry trade shows, Disney trips, and a good game of cards. Frank was preceded in death by his parents. He is survived by his wife of 53 years, Trudy Whittington; daughters, Cindy Beale, and Tina Wheatley (Mike); grandchildren, Brandi Beale, Elise Wheatley, and Nick Wheatley. A funeral service will be held at 2:00 PM on Wednesday, March 27, 2019 at the Chapel of Mowell Funeral Home, Fayetteville, with Reverend John Barnes officiating. Burial will follow at Camp Memorial Park, Fayetteville. The family will receive friends from 5:00–8:00 PM on Tuesday, March 26, 2019 at the funeral home. In lieu of flowers, please donate to the Wounded Warriors Project, www.support.woundedwarriorproject.org. "Email Address" would like to share the life celebration of Frank Whittington. Click on the "link" to go to share a favorite memory or leave a condolence message for the family.